Editor’s note: On August 28, 2014, Google ended their Authorship program. To discover what this means for you as an online content creator, check out this post by Sonia Simone. To say Stephen King is prolific is a gross understatement. Since he published his first novel (Carrie) back in 1973, he’s written over 70 more. King also wanted to answer the question of whether success was related to luck or talent. He went as far as purposefully suppressing the marketing of his Bachmann books. His little experiment ended prematurely when someone outed Bachmann as King … but the results were clear. The Bachmann book Thinner sold 28,000 copies during its initial run. When it was identified as a book by King, it sold ten times as many. When it comes to creating great content … it really does matter who you are. And this is equally true online. Authorship markup might prove to one of the most confusing conversations in our Author Rank series. Authorship markup is not the same thing as Author Rank. Authorship is how Google knows that an individual human being named Brian Clark published that article. Author Rank, on the other hand, is an aspect of the search algorithm that Google appears to be implementing. There isn’t enough data yet to identify precisely how it works, but advances like authorship markup, Google+, Search Plus Your World, Agent Rank, and so on certainly look like they’ll play an increasingly major role. Authorship markup is also confusing because it’s difficult to implement (or used to be). Authorship markup made a big splash toward the end of 2011 — about two months after Google+ launched. Many people praised the move because of the impact it had on search results. While by itself it wouldn’t help you rank higher (you still have to create great content), it would help you stand out. Any doubt on which link you will click on? And, as you might have guessed, implementing authorship markup typically increases click through rates to your site. Shortly after its implementation, sites ran tests to see how much it increased markup. In some cases the increase in click through was as high as 150%. This is exactly what happened to Catalyst. Cyrus Shepherd further increased free traffic with authorship markup by doing nothing more than plugging in a better headshot. Click on “by Brian Clark” and you will land on his Google+ page. Click on “More by Brian Clark” and you’ll land on a page that serves as a mini search engine that serves all the examples in which “content marketing” and “Brian Clark” are mentioned. Those links are potential clickthroughs, too. 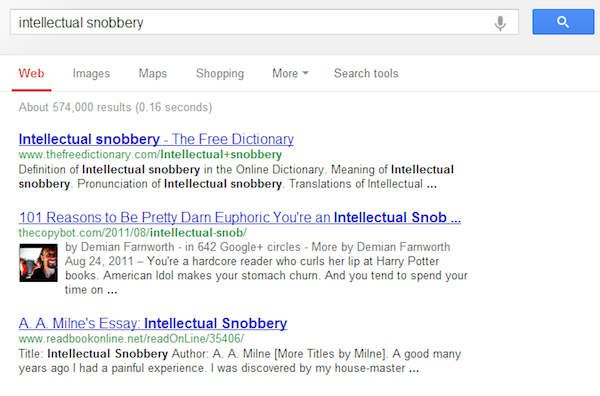 Look back at that image for the search phrase “intellectual snobbery.” I might as well have the number one spot because my listing stands out from the others. That visibility is a huge advantage. In fact, eye tracking studies are showing us that the eye is first drawn to the image, then to the headline (which is why writing seductive headlines is so important). Furthermore, studies have shown that by placing a photo so that you’re looking to the right (toward your listing) encourages people to actually look at your listing. Let’s look at another interesting perk of authorship markup. Imagine someone clicks your listing, wanders down your page for about two minutes, and then, satisfied, hits the back button. It’s the additional links beneath Charissa’s listing. Those weren’t there before, and they actually equal more opportunities to get people to look at your content. Google is probably thinking this: if someone clicks through to your page, but bounces out immediately, then your content is weak, and the user is not interested in seeing more. If they stayed on your page for at least two minutes, however, that demonstrates to Google that your page has value, and perhaps other pages will provide additional information useful to the user. In other words, SEO and user experience are blood brothers. This is yet another signal in the Google machine that suggests useful, unique, and authoritative content is valued and rewarded … but it also reinforces another idea very important to us: the writer runs this show. Authorship markup and Google+ are two sides of the same coin. Google+ is the identity platform (which is why your Google+ ID is a long string of numbers, not unlike your Social Security or driver’s license number) … and now authorship markup is the digital signature. Exactly what they need to pull off something like Author Rank. In essence, Google is saying … we want to make sure that you are a real human being … we want to stamp out anonymity and spam … we want to regard you as someone who is willing to put your name on the line for the content you create and share. So … are you willing to put your name on the line? Together, authorship markup and Google+ work hand in hand to deliver some pretty slick benefits to the writer … to signal that the writer truly does run the show. Beat plagiarism — With authorship markup, the original author will be pushed to the top of the search results over content scrapers. Elevate the role of the writer — As you build your reputation in two or three specific categories, and your content follows you around … businesses will start to recognize the value of a good writer — and stop paying malt liquor prices for exquisite craft beer product. Verify guest posts and comments — Your Google profile also follows you across the web into comments and articles published on other blogs. Rank for different topics — Author Rank isn’t a wholesale score, but rather … broken down into categories. Which means you can be an expert in content marketing and skydiving without either of those categories watering down your score for the other. But this doesn’t mean you should try to be an expert in a dozen topics. Limit it to two or three. Establish authority — An author with a Google+ follower count of 32,299 is going to be recognized as a higher authority than an author with an account of 3,299. Why? Because of a number of factors we discussed in the Google+ article. It’s not perfect, but it’s something. It’s social proof. Keep people from hijacking your name — Finally, authorship markup will overcome the challenge that might occur when you share a common name like John Smith. Or, Brian Clark. If two articles appear in the search engines by people with the same name, the verified account will be deemed more credible. I need you to do three things. First, claim your content with authorship markup. You can head over to Google authorship markup support and follow the directions (you have two options). Or, if you have a WordPress site and are using the Genesis framework, then you can claim your content in three easy steps. Next, I need you to join us on Google+. We’ve got a growing, lively community where we share smart online marketing content and groovy 80s music videos. Finally, wait patiently for the last article in this series — The Content Marketer’s Author Rank Cheat Sheet — where I bring all of this home. … and make sure you subscribe to Copyblogger so the next one lands right in your inbox or RSS reader. Cool ! Google can know about content creator, and gives authors a chance to be a part of search result. let me know whether Google recognize an author common to all his/her contents around web. I mean If I am posting any where on the web does Google accept all contents by me (Author) along with website ?? No I think only when you use the appropriate tags, rel author, etc will Google know that content is yours and puts the pic in search results! For anyone blogging this is very useful or even for anyone with articles. Nice post. Jack is right. You need to use rel=author tag linked to your G+ profile, so Google can credit your authorship. P.S. Don’t forget to add yourself as a contributor for your site within your G+ profile. Elevating the role of the writer and building trust, the best advantages from my point of view! Great article Damian, thanks for sharing. What if you’re using something other than a WordPress site? I’d like to ask for one thing. Does author rank increase my rankings in google. I heard that it do. Waiting for your next posts. Thanks again. AFAIK that hasn’t been shown yet. Everything G is doing and saying suggests that it will, but it’s all very new and there’s not enough data yet to make a solid statement. Very thorough article; well done. Every time I see someone pointing out how much higher click-through rates are, though, they always show an example dealing with an informational search query. I suppose that, given the nature of what SEO-types peddle (information), it’s only natural that they see the search world with a sort of informational tunnel vision. I’d love to see the same sort of data for an obvious product search. An eCommerce website not only should have unique, helpful content on all of its product-related pages to do well in the search engines, but there are often excellent resource articles available on a good eCommerce websites. If the authorship tag is put on an eCommerce website and someone is searching for “discount green widgets,” are they really more likely to click the result with the picture of somebody’s face next to it? Some have suggested that just the opposite might occur, reasoning that we have been conditioned to believe that whenever there is a picture, it is some sort of article and not a website that actually sells what we are looking for. They suggest that searchers might instinctively skim past the one with the picture because of that. I can see that happening. I guess I’m just waiting to see the proof one way or the other when the search is about buying something. However, I’m just curious about one thing. I am a starting blogger (just a few posts, nothing special.) I have no subscribers on my e-maillist, no Facebook fans and nobody who gave me a +1 on Google or whatsoever. When I claim my Google authorship and start posting more, Google will recognize that nobody likes or shares my stuff (mostly because I just got started)..
Won’t that be an negative effect on my Author Rank? Should I wait untill I have some fans who can share and like my content, or is it wise to register it, even though I have nobody to like my stuff? Really curious about your opinion. I would get it registered and credited now so you get full credit for everything you do as you move forward. Even just the benefit of having your image associated with posts will help you get a few more clickthroughs and will move you in the direction you want to go. Hey Elwin, get started now. We all start from scratch (with nothing) and have to build our audiences. See the previous two posts in this series for more on how to build your G+ profile … and of course there are plenty of resources on Copyblogger to help you create great content. If you regularly publish useful content and link it to a Google+ profile, more and more people will find your stuff. And please don’t call your blog “nothing special.” If you love your topic and are eager to help people with your words, it is very special. It is definitely worth it. Just about the moment I learned about it I jumped to the chance to take advantage of it. It just makes sense because I realized that whenever I search something and there are Google authors (before I even knew what it was), I click on the one with authorship simply because there’s that sense of credibility. Of course, that isn’t always the case (anyone can do it,) it’s almost natural to gravitate towards them. The “Fast Company” article says that Google+ authorities are fudging figures and the engagement there is very poor. Do note that the article is nearly a year old — that’s a long time in our world. No one can tell you what’s going to happen in the future. Here at Copyblogger, we’re betting that G+ is a good investment of your time. We’ll share what we learn, and what you do with that is up to you. Oh am sorry. I didn’t notice the date. Actually that article was mentioned in a recent article (6 March) of Freelance Switch. I didn’t expect that a top notch blog like Freelance Switch would quote one year old statistics. And keep in mind, too, that you have to roll your sleeves and dig in to the social site. Join communities, write posts, re-share content. Eventually you’ll gain traction and see that G+ isn’t a ghost town. Yes I’m doing that. Thanks! Thank you Ms. Simone for clearing my doubt. I didn’t usually comment because I thought you people must be very busy to reply to comments. Yes I saw you guys replying to other people but I thought those people must be high profile bloggers with whom you were interacting through comments. I didn’t know ordinary bloggers like me were treating on an equal footing. You took my comment as seriously as you take your posts. Perhaps that’s why Copyblogger remains a top notch blog. I’m learning a lot from this series, so thanks for that. Do you have any tips for using Google Authorship if Google doesn’t recognize your email address? I was able to connect my Gmail address with Google Authorship but when I try to connect my work email (which the majority of my writing is bylined with) I get a message stating “Please use a valid email address.” I checked around a bit on Google but don’t see anything about this particular situation. Authorship is tied to your G+ profile, not your email address. You need a gmail address for the profile, but you don’t need to use that gmail as your primary email address by any means. You can definitely publish under a different email address (I do) and still have your content credited to you. Awesome post Demian! Loved it. But the only place Google+ Authorship gets sticky is in personalized search where the Authorship signal often gets confused with the social signal. What are your thoughts on this? P.S. Do you think Google might judge your authority based on your Google+ engagement? Regarding your other question, there isn’t any way of knowing for sure but I think the answer is yes. I’ll talk more about this in the next post in this series. Demian what I meant by this is there is no indication that Authorship is impacting rank but is solely being used to highlight authors in search results. The only place this gets sticky is in personalized search where the Authorship signal often gets confused with the social signal. Demian thanks for the article , definitely everyone needs to claim their Google Authorship , it’s a low hanging fruit, but some ppl dont really care , there are still businesses out there who keeps on blogging without any author on their blogs. Cool! I was looking for more info about google authorship and here it comes! fantastic – thanks! I could see this redefining web search pretty quickly. It will likely end up like ebay no image no click. Do you think Google’s competitors will respond with their own versions of this technology? How do you think Yahoo and Bing will respond to Google Authorship? From what I have heard, Yahoo and Bing are likely to incorporate Facebook in a similar style. But…while Yahoo/Bing is growing, it still pales in comparison to Google in terms of searches; and Google is so much better and more adept at using personal information smartly than Facebook. Well, never knew it was a such think as this “Google authorship markup.” Will have to invest some time today to head over to the support page. Thanks for the article. That’s good news. Glad to hear MaLinda! This is a great article! I implemented authorship on my site a few months back, and it really is nice to see my devilishly handsome face show up alongside various results. The authorship tag isn’t the only important tag to implement, but it’s a great start and it does seem to have made a positive impact on traffic to my site. Google Authorship have changed how my behaviour when searching for something. I always look SERP results that comes with ‘pictures’ or ‘avatar’ first. Great insight. I tried the above and followed Brian’s step by step process yet when I searched for and found one of my articles on Google My Authorship mark-Up doesn’t show up. Is it meant to show every time or is it selective? Gregory is right, and even when you do have it fully set up you might come across some articles that don’t have your markup. Thank you for the article. Do you have suggestions on what to do when you have more than one business? Each business has its own email, address etc. Does Google figure out multiple emails and business locations OK or am I kind of forced to choose which ever business is most important and use that email and location? Yep, create a separate G+ business page for each business, and use the rel=publisher tag (that is if you are trying to build up the brand and not an individual behind that content on that business’ website). I guess my first choice would be to build my authorship as an individual versus the businesses. Each has its own email address. One is much stronger than the other, so I use the strong one. Thank you again. I have just set up a google+ account and just gone in and verified by e mail do I still have to put in tags on my posts and if so all of them or just on the blog I know I sound a bit dumb but it has all just got a bit confusing. Hi Lee. I believe you’ll still need to add the tags; I tried claiming authorship without doing that part and it didn’t work. Great article, thanks Demian. It took me ages to get round to claiming authorship and I still don’t know why I waited so long. My Google+ profile is still relatively new and my following is tiny but I guess you’ve got to start somewhere. That said, I’ve made more connections with people I didn’t already know in far less time than I ever would have on Facebook and Twitter. Not to mention, the interactions I’ve had on Google+ have been meaningful exchanges, not just mindless retweets and likes. Time will tell if I get more traffic as a result of the authorship markup but I’d be amazed if I don’t. Thanks for clarifying an often overlooked issue. Great post! I have a question: if I write for multiple sites, can I claim the authorship for all of them? Let’s say, I write on the personal blog and on the company blog. Yes, you just have to claim yourself as contributor to those other sites in Google+. But you want to connect your main site with G+ with the authorship markup. 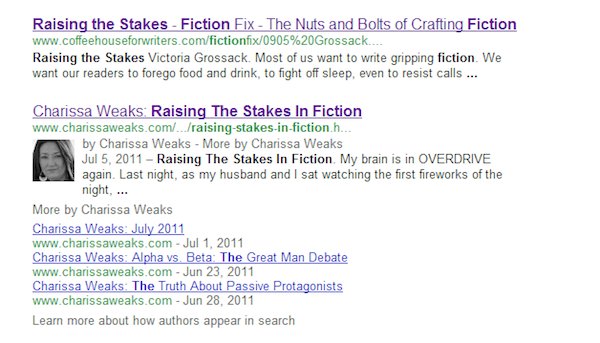 I am already using author markup on my blog articles, and it works great. The articles are posts in a WordPress blog. But I’m wondering if I should somehow force my Home Page to have author markup as well. The home page is a page full of article excerpts. I’m not sure if it would look funny or not if my face is next to the listing for my site home page in the SERP — after all, it’s not an article it’s pointing to, but my site. And I’m not sure what Google would think about this. I’d say go for it if it’s possible. As the CB team always say “think about people first” so if it’s a site you own then having your face next to the homepage SERP would bring recognition from people who have seen your articles elsewhere around the web. Demian, By using authorship can one republish same content on other website or blog? Or will it be same as duplicate content even though same author is republishing content? It’s still duplicate content, but when spread across other web properties no worries on getting bonked by Google. It’s duplicate content on your own site that matters. What you want however is the original content on YOUR site to rank higher … so you want to claim that content. In the end, I’d recommend you didn’t distribute duplicate content, and create original. I was thinking on similar lines but was not very confident about my thought. 🙂 Thanks for the clarification. No doubt…this is a great article. But I am definitely in need of the cheat sheet. And lots more info on this and Google+. Very thankful I can count on you guys! I am working towards becoming the author for the company I currently work for. While I do not plan on leaving any time soon, I do need to keep this in mind. I have been playing around with several ideas and was hoping to get some feedback. Option one is to use a publisher tag instead of an author tag. What would be the benefits or drawbacks on this? Option two is to create a pseudonym, an ‘employee’ that will never leave the company. This seems to be the most popular option around the office, but not for me. Basically, I understand that the company would want author rankings permanently linked to them, but surely that ranking will never go away? It would be more beneficial for me going forward to publish under my own name, get my own ranking up there and be able to move on with some form of credibility behind my name? Unless I am completely mistaken, authorship ranking is determined by how active you are, quality content and so forth. Surely the company would still benefit from my writing even after I leave? I would still be writing and therefore the tag is still relevant? Just my thoughts. Any feedback would be appreciated. Hi Christa, yes, you are on the right track. Don’t write with a psuedonym, and use the authorship makrup (not the rel=publisher). You’ll grow your reputation and your company will benefit in the future. Great post and I think that you have covered each and every thing. One think I want to add is how to use authorship strategically. It’s all depends on you are focusing on and which content you are publishing. If it is professional content, then use your expert. If it is about the strategy of your company then use your CEO. Very awesome article!! I’m so glad this is a 2013 article too. Thanks bro. I learned a lot about Google authorship. And I promise to use my newfound knowledge for good, and not evil. You’re correct, Michael. This is the latest trend and route towards establishing authority on the web. Once that trust is established, those scrapers who like to scrape articles and post it anywhere else will not be good anymore. Well, this may not be a total solution to solve plagiarism, but it makes claiming the ownership of the article easier. Perhaps, Google will let it be automated in the future. Thanks for the great information! Hopefully I have utilized it effectively! After reading several articles about Google’s Authorship, I have a few questions and hope to get some feedback on best practices. What is the best way to handle authorship when it comes to web sites that are about entirely different topics? If Google claims articles by the author’s name, then all the articles posted about mutually exclusive topics will appear in the list of the author’s articles. That is something that I find undesirable. Is it okay with Google if you use different Gmail accounts, with the same user name, and assign a different web site to each email address? The result hopefully would keep the articles of similar topics together instead of articles from dissimilar topics. The one glitch would be if Google ties together the two gmail accounts and combines the authorship accounts, then the whole thing would turn out to be an exercise in futility. If I understand your questions correctly: One authorship account per person. That’s one email address. One account. Anything you write can be tied to that authorship/Google+ account … whether it’s on your own on site or a guest site (but they have to do a few things on there end to make it work). If you don’t want topics tied to that account, don’t claim them. Hope that helps. You understand the question and your reply is what I assumed, but when I looked closer the only thing that closely related was about non de plumes (Google: nym/wars). Google absolutely does not allow you to use anything except your legal name, which isn’t the same thing as using two gmail addresses that have the same name. I mean there are going to be a lot of people with identical names, i.e. do a search on Facebook for a good Irish name like Michael Sullivan and you’ll dozens of hits. What I’m unable to definitively find is where it says that Google allows only one Authorship per person. If anyone can point the direction to where it is spelled out in Google’s policy please share. Let me be clear on my intent. I write about two unrelated areas of interest and do not see where readers will benefit, which one would think is in line with Google’s philosophy of delivering the best information to the end user. For example, if someone wrote about flower arranging and also soccer the end users do not benefit knowing about both topics. In fact when an author writes on two diverse topics it is a disservice for the end user to have to cull out the soccer articles by a particular author when they really only want to read about flower arrangements. Maybe someone from Google who has knowledge of Authorship will read this and proffer a clarification on the game rules. Thanks for the suggestion, Demian. Maybe I’m just overthinking the whole thing. Perhaps someone who has already reasoned their way through this will share their thoughts on the topic. What’s important is that Authorship gives ownership to content, which means those scrapers won’t gain ratings from someone else’s work. Hello All! Thanks for the informative article and the helpful comments discussion. I have historically spelled my name “Vaneeesa,” on sites like Twitter, WordPress, etc. But when I signed up for both Facebook and Google+ I was forced to change the spelling to “Vanessa” to meet their requirements. And through Facebook Connect, that spelling has propagated elsewhere. So today there are many sites with each spelling. I did sign up for Google Authorship and it is working, but the search results for “Vaneeesa Blaylock” aren’t as compelling as I’d like, and some sites that I don’t really use are ranked higher than, for example, my blog “iRez.me” where I post as often as daily. Any idea if the 2 spellings are hurting me? There is a possibility that could be hurting you only because search engines prefer consistency. You want your information to flow across all platforms. İts been a while that i dont read this much illustrative post, great for you demian, i love the post. added to my circles anyway.